As you can see from the figure to the right, it is recommended to place your entry order after the candlestick touches the support line. You should do this when buying a currency pair. We call this the bounce trade. Recall from your support and resistance tutorials that the market tends to not move below its support level (red line) and just in case it did, we have put a stop loss just after the red line. Now you see how important it is to plot the right support and resistance level. Also, some might ask why not just put your entry order on the support level. The thing is, you might miss a great profit opportunity if the market did not reached that price and bounced right up afterwards. Hence, even when the market is moving up, you have no positions. Therefore, putting your entry order before the market bounces up serves as a double confirmation that it is going to continue rising and you can sell at its peak. Of course, deciding when to exit your positions is also another high level skill one need to acquire in order to become profitable in trading. Notice the white downtrend. When we want to sell a currency, we have to make sure we sell at a level that is just below the resistance level of the downtrend. We put in a stop loss above the resistance level of the downtrend just in case the market moves past the downtrend resistance levels. When you enter the market just below the resistance levels of the downtrend, you are verifying that the market is going to continue its downtrend which should not be hard to identify if you have plotted your trend lines correctly. Trading the bounce (so called because of the market's patterns) is one of the most basic trading strategy one should get acquainted with. Trading the bounce is exciting and simple. However, in the reality, support and resistance levels do not always hold. There are 2 different ways to handle a break in the support and resistance levels. One way is to play the market aggressively and the other is to be more conservative. You sell a currency pair whenever price goes below the support level. This is in hope that the market will just dive right down. You buy a currency pair whenever the market moves past the resistance level. This is in hope that the market will continue its uptrend right after. As you can see, there is huge risks involved in trading this way. There are times when the market just react to a series of uptrends and downtrends and if you trade using this way, you will incur immense losses when prices retract from the respective support or resistance level. 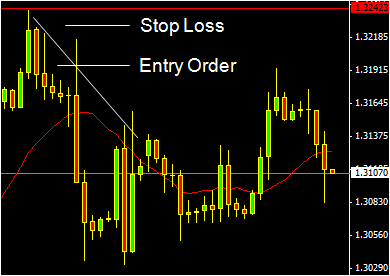 That is why stop losses order are so important. You set a price level and if the market moves past this level, it will automatically close that order, minimizing your exposure and risks. Basically, you confirm that that the market is indeed breaking its support before you enter into the market. You can see from the above figure that there is double confirmation for the market in breaking its support level. If you play the market the aggressive way, you will begin to sell the currency pair the minute the market breaks its support level. It is highly recommended to trade using the conservative method. However, this is not a frequent occurrence. There is time where the market will just bounce right back upwards after the pullback to its support level. 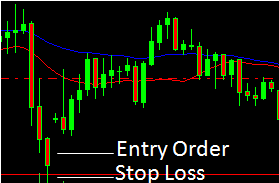 That is why it is so important to set stop losses and stick to them instead of adjusting your stop losses in hope that the market will perform to the way you want it to. 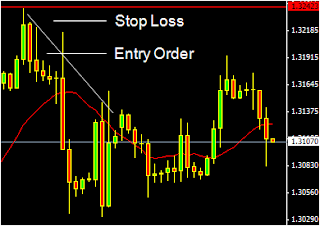 I learnt this the hard way by losing over $500 in one trade selling USD/JPY currency pair. I will be talking about this big mistake soon. Do look forward to the next tutorial where we will touch on candlesticks analysis, my favourite way to view the market.